STEVE ANDRASCIK/LAS VEGAS REVIEW-JOURNAL Coronado High School runner Sara Dort (164), approaches the finish line in first place during the 2011 Southern 4A Sunrise Girls Regional Championship cross country race at Veterans Memorial Park in Boulder City, on Friday, Oct. 28, 2011. Dort finished first with a time of 20.32.09. STEVE ANDRASCIK/LAS VEGAS REVIEW-JOURNAL High school girls participate in the 2011 Southern 4A Sunrise Girls Regional Championship cross country race at Veterans Memorial Park in Boulder City, on Friday, Oct. 28, 2011. Del Sol’s Nick Priego wasn’t concerned with his time on Friday at the Class 4A Sunrise Region boys cross country meet at Veterans Memorial Park in Boulder City. That turned out to be the perfect strategy. Priego won what turned out to be a tactical race, pulling away from the pack to take the 3.1-mile race in a relatively slow time of 17 minutes, 23.3 seconds. A lead pack that included Priego, Doug Harris of Green Valley, Martin Ponce of Tech, Brian Marshall of Foothill, Alan Ekanger of Coronado, and Alex McMillan of Valley hung on each other’s heels through the first half of the race. Harris was second in 17:29.6 and McMillan third (17:35.5), followed by Marshall (17:36.3) and Ekanger (17:44). 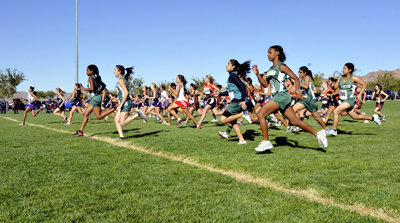 Green Valley won as a team by packing four runners in the top eight and the finishing with 43 points. The battle for the second spot at state couldn’t have been closer. Tech, Coronado and Foothill each had one runner in the top 10 and all five scoring runners in the top 30. 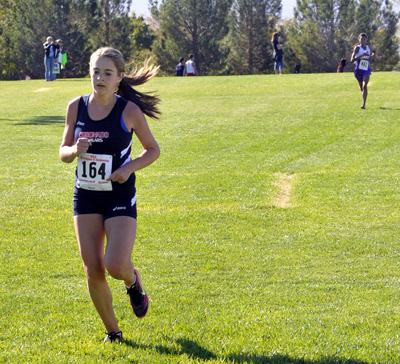 In the end, the Roadrunners prevailed with 76 points, edging Coronado (78) and Foothill (85). It was the second year in a row that Tech had managed to pull a mild upset and make it to state. The Sunrise girls race also was up for grabs through the first two miles. Jessica Raymond of Basic and Ebonique Diaz of Sunrise Mountain were one-two at the mile, closely followed by Alyse Vanek of Foothill and Sara Dort of Coronado. Dort was not to be denied, winning the race in 20:32.9. Diaz was second in 20:40.9. Basic’s Jessica Raymond placed third in 20:45.8, followed by Coronado’s Kelly Smith in 20:49.0 and Taylor Lauten in 21:16.7. Coronado’s girls placed all five of their scoring runners in the top 15 en route to a winning score of 39. Green Valley was the runner-up with 52 points, paced by Lindy Eskin’s sixth-place finish in 21:19.1.